When Reprints are made from Handstamps, it is often difficult or impossible to tell Originals from Reprints unless the basic stamps used are different. This is true, for example, of CMT overprints from the Romanian Occupation of Pokutia. 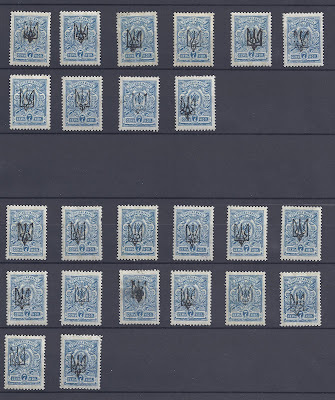 Sometimes, it may be possible if a large multiple is being looked at but impossible for single stamps. 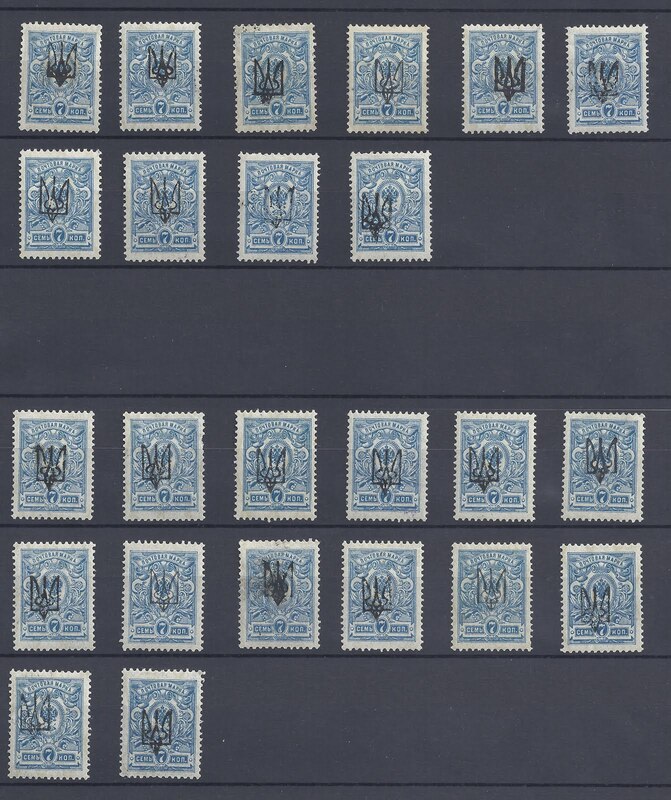 Both Dr Seichter and John Bulat thought they could distinguish Original Kharkiv Trident overprints from 1919 Reprints made to order for the Riga stamp dealer, Dzenis. In some cases, the basic stamps used are different and then it ought to be easy. But when the same basic stamps are used, I am not convinced that it is always possible to distinguish the Reprints. Now take a look at the stamps above. In the top two rows, copies signed Dr Seichter and (in one case - the last stamp) Bulat. 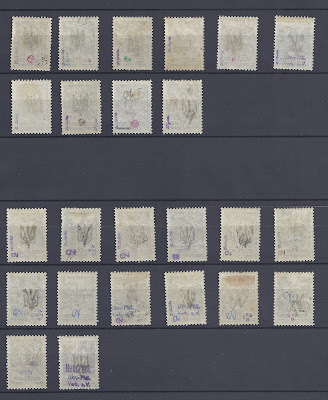 In the bottom three rows, stamps signed Dr Seichter or UPV with the addition of a "ND" [Neudruck = Reprint] handstamp or manuscript note. I have stared at these stamps for some time and I come to this conclusion: I cannot see ANY consistent differences between the two groups of stamps, when examined either from the front or from the back. The ink quality is similar and penetration of the ink seems to depend on how much the handstamp was inked. Only the stamps in positions 18 and 21 have that crisp, light inking which I think of as an indicator that a stamp is a Reprint. But the majority of stamps have black, oily-ink overprints, sometimes smudged. Can anyone show me that I have got this wrong? And how should I sell these stamps?